The Natural Sleep Store carries a large selection of natural and organic pillows to outfit your bedroom. Always covered in organic cotton, we offer many different pillow fills such as organic cotton, wool, natural latex, organic buckwheat, organic millet, and kapok. Adjustable-fill pillows as well as contour pillows are available. 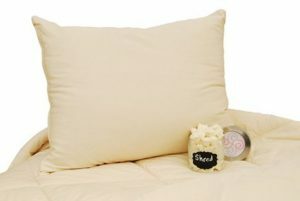 $50.00 – $186.00 Adjustable pillow filled with bits of wool. A customer favorite! 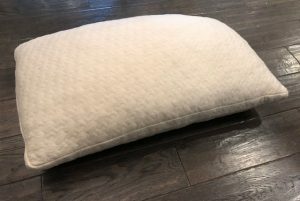 $50.00 – $136.00 Natural shredded rubber pillow. Adjustable and great for multiple sleeping positions. The 100% GOLS Certified Organic Latex formed contour pillow features a soft all natural dunlop latex which has contours for the neck. This pillow is covered with a removable zippered organic cotton knit fabric. The cover is washable. 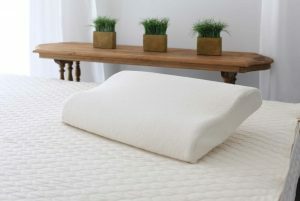 This is a regular profile pillow that is ideal for side sleepers that need orthopedic neck support. 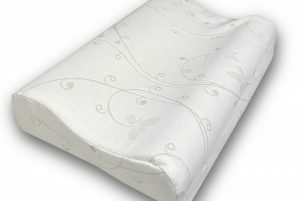 $128.00 A contour rubber pillow with a zippered organic cotton cover. The Suite Sleep kapok pillow is filled with premium grade kapok silk. Kapok silk comes from the Kapok tree which grows in tropical climates close to the equator. Kapok silk is one of the most sustainable materials on the planet as it is the byproduct of the trees’ annual bloom. Kapok silk is soft like down, yet has none of the allergens that down has. Each pillow has an organic cotton sateen cover with a zipper allowing you to add or remove Kapok to find your desired pillow comfort level. You can also purchase this pillow with the addition of a removable case made from a gorgeous floral stretchy knit organic cotton. 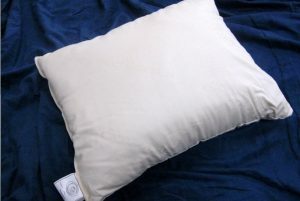 $100.00 – $128.00 Soft adjustable pillow made from kapok silk. A great alternative to down. This one of a kind pillow combines the best qualities of two great materials. The resilience of natural latex, in noodle form, mixed with the soft airy quality of natural kapok provides a soft but supportive feel. Enclosed in a 420 gram weight organic cotton jersey knit zip off cover, you can add or remove fill to create the perfect amount of support for your neck and head. As always, with Freefrom products, this product is free from chemical flame retardants and other synthetic materials. $105.00 – $115.00 Natural latex noodles and kapok in an organic cotton zip off cover. 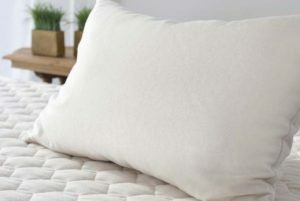 This economical GOTS certified organic pillow offers all the benefits of wool with a soft, springy, and resilient fill. Perfect for back, side and stomach sleepers alike, our spiraled wool pillow is soft and supportive in a medium loft. A luxurious, 300-thread count cotton sateen cover provides a comforting, cooling sleep. Our spiraled wood is created by tumbling raw wool fiber until spiral shaped balls are formed, and this unique spiral shape ensures optimal support and comfort. All of our wool is GOTS certified organic, so you’re guaranteed a completely natural, non-toxic pillow. $85.00 – $115.00 GOTS certified organic spiraled wool pillow in a medium fill. $99.00 Natural shredded latex in an organic cotton zip off cover. Crescent Moon Alpaca Wool Pillows feature 100% natural, organically grown Alpaca wool from Canada for superior warmth and comfort. Alpaca wool is encased in a 260 thread count organic cotton and finished with piped edges. $109.00 – $279.00 Crescent Moon Alpaca Wool Pillows feature Canadian Alpaca wool and organic cotton casing. 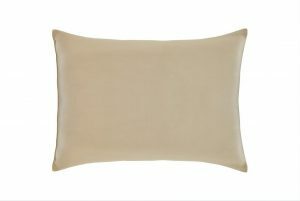 This pillow is made from soft silky kapok covered in organic cotton sateen. Kapok is a silky fiber, and feels much like milkweed or down. It is harvested from the seed pods of a kapok tree (the tree is never cut down). 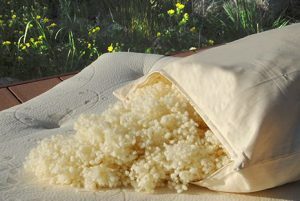 This natural pillow will compress with use but can be placed dry in a hot dryer for 10 minutes to help plump the pillow. This is our softest feeling pillow. Comes with a zipper so you can add or remove filling. $90.00 – $110.00 Made with silky kapok. Our softest feeling pillow! This pillow is made from certified organic wool and is covered in organic cotton sateen. Wool will not compress as much over time as an organic cotton pillow. Wicks away moisture on hot nights to help keep you cool and insulates on cool nights. Spot clean only. Comes with a zipper so you can add or remove filling. 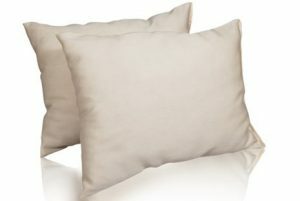 $126.00 – $180.00 Certified organic wool fill pillow. 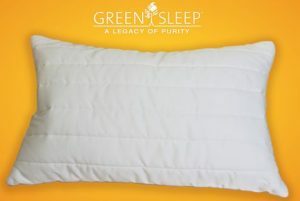 This pillow is made from certified organic cotton batting from the Texas Organic Growers Marketing Co-op. It is covered in organic cotton sateen. 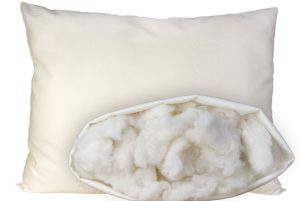 This is a great vegan pillow for those who do not want natural latex or wool. This is a firmer feeling pillow. Comes with a zipper so you can add or remove filling. 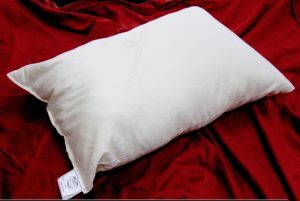 $84.00 – $115.00 A 100% organic cotton pillow. A great vegan option! The OMI GOTS certified organic wool pillow comes in 3 different fill weights (light, medium, and full) to accommodate different sleeping preferences. Organic wool resists dust mites and wicks moisture to keep you cool and comfortable. $99.00 – $159.00 GOTS certified organic carded wool pillow in different fills. The Sleepy Sheep Organic Cotton Pillow is filled with 100% certified organic cotton and covered with a certified organic cotton damask fabric. 100% vegan this pillow is a great alternative to wool. This pillow comes in a variety of sizes including euro and body and can be customized to a medium or firm fill. Handmade in Portland Oregon. $82.00 – $216.00 Organic cotton batting covered in organic cotton fabric available in two different fill weights. The Sleepy Sheep natural wool pillow is filled with pure Eco-Valley Wool farmed in the Pacific Northwest. Covered in an organic cotton damask, this pillow is a fantastic choice to create a healthy sleeping environment. Pure Eco-Valley wool is a natural temperature regulator and naturally resists dust mites. This pillow comes in a variety of sizes including euro and body and can be customized to a medium or firm fill. Handmade in Portland Oregon. $96.00 – $303.00 Natural wool batting covered in organic cotton in two different fill weights. 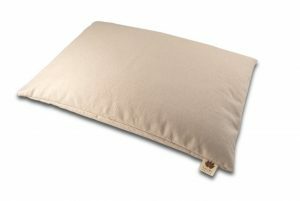 Need help choosing an organic pillow? Read our blog post for help choosing the perfect organic pillow. Choosing the right organic pillow is very important! You are off to the right start since you are choosing organic and chemical-free. However, as each person is different, it is important to choose the pillow that will fit your body, your sleeping position, and your comfort level. 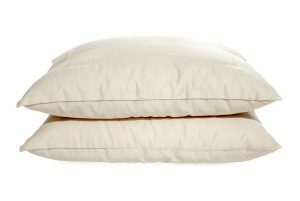 Our organic cotton pillows and organic wool pillows have a feel similar to conventional polyester filled pillows. If you prefer a conventional pillow, one of these pillows can be right for you. Several of our wool pillows have different options for firmness from slim to heavy fill in addition to one adjustable wool pillow. Our favorite natural pillow is the Suite Sleep Wooly Bolas Pillow. This pillow is made up of little “balls” of wool that can be added or removed through the zippered cover. The wool can be moved around to create more or less neck support and/or an indentation for your head. We find that through either removing or adding wool, this pillow is ideal for most people. Many of our customers like the shredded rubber pillows. 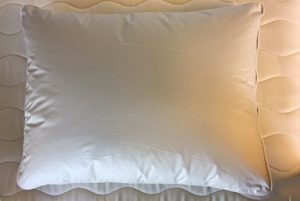 The pieces of natural latex/natural rubber that make up the pillow can be moved and squished around inside of the pillow, for example, to create more support at the neck area, or to create an indentation for the head. Although the feel is different, it is this malleable quality that makes it similar to a feather pillow. Since it can be squished around, this pillow can be ideal for many different sleeping positions. The kapok pillows have a feel that is most similar to down pillows. The kapok inside can be squished around and is light and “feathery”. Many people converting from a down pillow like this option. Our contour pillows offer the most support, however, the height of the “roll” of the pillow needs to be just right for your body in order for this to be a great option. Many people who like a memory foam pillow have success with the contour pillow.